To be honest, I LOVE teaching English online. Sure, there are smaller challenges to working from home. I’m responsible for managing my own time, I occasionally have to fight feelings of loneliness and I may never wear non-stretchy pants again (OK, that part I’m good with!) - but the downsides are easy to overcome and beyond worth it. For me, teaching online has been key to that ever elusive work-life balance. It’s meant flexibility, more time that’s mine to devote to studies and my personal life, location independence so I can travel when and where I want and freedom from the dreaded morning commute. Seriously - I can’t stress the upsides enough. Watch this: Teach Away’s info session all about landing an online English teaching job, where I share my experience teaching online for a living! And I know from experience it can also feel overwhelming sifting through all the different job descriptions for online ESL teachers. If you’re not sure how to narrow your search, we’ve got you covered with this roundup of some of our favorite online English teaching companies hiring right now, below! 2 things to do before you apply for an online English teaching job. Before we jump right into the list of companies hiring, let’s have a look at two crucial things you’ll need to have/do before you send your application in. 1. Generally, you’ll need to be fluent in English and have your bachelor’s degree. OK, while there are a select number of online English teaching companies that don’t require a degree, for the most part you need proficient English language skills and a college degree (which doesn’t have to be in education). No big shock there. 2. Make a list of online English teaching job must-haves. 8 of the best online teaching companies to work for. 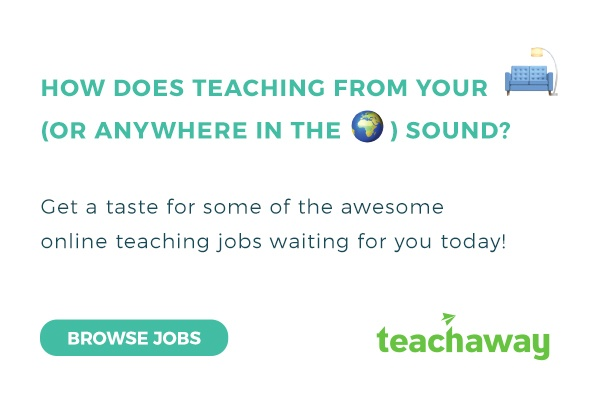 Hey, licensed teachers, ESL instructors and university graduates - you’re already on the Teach Away website, so why not apply to join the team right now? We’re looking for people who want to take their passion for education and combine it with either a full or part-time work-from-home teaching gig. If you're a former or retired teacher, or even a working teacher who still loves their day job but is looking to supplement their income over the summer break, teaching English language learners online with Teach Away might fit the bill. Then VIPKID might be a great option for you. It’s quick and easy to select which hours you can teach. Just log onto the VIPKID portal, and click on as many 25-minute time slots you want. Parents can only book lessons for their child one week in advance, so if you decide you want to take a vacation in two weeks time, you can! Essentially, as long as a time slot isn’t booked, teachers can close it off at any time. They also pay really well. VIPKID teachers make between $14 - 22 USD an hour (teachers are given a base salary of $7 - 9 per 25-minute lesson). Your base salary depends on your performance in your interview and demo lesson. On top of the base salary, there are a number of participation incentives and bonus opportunities. Teachers receive $1 for every class they are on time for, another $1 per class if you teach more than 45 lessons in a month, up to $100 for a successful teacher referral and more! VIPKID highly values you being able to deliver all lessons that parents have booked, so it is important to note that if a teacher does cancel a lesson with less than 24 hours notice, they will take a deduction from your pay. However, if a student does not show up for their lesson or cancels with less than 24 hours notice, you get full payment for a major course or 50% payment for a trial class. Do you have a set routine and are looking for a consistent weekly work schedule? Do you have some empty spots in your Google calendar? DaDa is one of the highest paying online teaching companies, so if you like money and routine, this might be the company for you! DaDa teachers make between $15 - 25 USD per hour depending on their TPR (Total Physical Response) performance in their interview. So make sure you prepare and practice so you can nail your interview and make the big bucks. Unlike some of the other major companies, you don’t have to be North American to work for DaDa. They are open to native English speakers from all over the world. How are lessons scheduled? All you have to do is provide your weekly availability (minimum of two hours, two days/week) and DaDa will assign students to you. DaDa does require 30 days of notice if you want to change your schedule, however, if your available time slot does not get filled and your standing time is greater than 30 minutes, you will still receive half payment for this period. It’s as easy as A,B, C, DaDa! Are you a university student looking for a part-time job to cover some of those big expenses like tuition, books and coffee to keep you energized in class? Something that makes Qkids unique, is they accept applications from current university students! Qkids isn't just for university students. If you have already completed your bachelor’s degree, Qkids wants you too! All teachers receive a base pay of $16 USD per hour with a $1 attendance bonus for being on time in addition to other performance bonuses. QKids teachers are required to commit to a minimum of 6 hours per week. Just log onto the teachers app to check your schedule, which will be released on a weekly basis Sunday evenings. You can even make changes to your schedule if you notify the Qkids coordination team 24 hours in advance. iTutorGroup teachers are paid $18 - 24 USD an hour, along with the chance to earn bonuses based upon both the number of students in their class and the ratings awarded by students in their class feedback. What would you do with an extra $300? Save it? Buy a-one way ticket to a new city? Order pizza every day for a month? If you get a job with Gogokid, you also get $300 in your pocket with their new teacher bonus! On top of that sweet perk, Gogokid is another one of the highest paying online English teaching companies, paying their teachers $14 - 25 per hour. Teaching English online to Chinese students aged 4 - 12. Do you live in the Philippines? If yes, first of all, lucky you! Also, you just so happen to meet the requirements teach English online with 51Talk. 51Talk is a company, based in the Philippines, that caters to students in China looking to learn English. All 51Talk teachers start with a $15 per hour base pay, which increases as you complete your training and earn performance bonuses. Teachers must work a minimum of 30 peak time hours per month, but they can also request to take up to 30 days off over the course of their contract. Do you love to chat on the phone? Now you can get paid to do it! With so many adults eager to learn English in Korea, English Hunt wants to provide them with opportunities to practice their conversational English skills by speaking about their daily lives and culture. AM teachers need to be available for the entire shift but those taking the evening shift can be more flexible. Heads up, digital nomads! While English Hunt only hires US applicants with a US bank account, you can live anywhere in the world. Just make sure you have access to PC technology because their software is not compatible with Apple products. So there you have it: eight of the best online English teaching companies that let you work from home! Before we sign off for the day, let’s take a quick look at some guidelines and questions that you can ask a potential online English teaching employer. Of course, you can always Google around to find the answers for yourself - there are lots of reviews on company Facebook pages, YouTube, Reddit, chatter on various Facebook and LinkedIn groups dedicated to teaching English online, and of course, company reviews on Glassdoor! Questions to ask before you apply. Do I need a degree to apply to this particular company? Do they accept applicants from my home country? Is an ESL certification, like a TEFL certificate, needed? Are there a minimum number of hours I have to work? How often can I make changes to my availability? Can I make last-minute changes to my schedule? Is it OK to work from anywhere in the world? Who are my students? What is their age? Where are they from? Is there anything I need to prepare for my lessons? Do I need to buy any technology or props to teach? What’s the base pay like? Am I paid by the hour or lessons taught? Do I get paid if a student cancels the day before or within 24 hours? What happens if my student is a no-show? Now that you’ve (hopefully) pulled together a shortlist of your top online English teaching companies and are ready to start applying for jobs, it’s important to make sure you get a solid grip on whether you’re really ready to teach online. While you’re at it, check out our earlier blogs on what teaching online is really like and what a typical day is like as a home-based online English teacher. Oh, and don’t forget to get your Teach Away profile in top shape so you can apply with just a click and land that dream home-based online teaching job faster.